Removing a sign is a delicate process that needs to be done with care so that you do not damage the existing veneer. Then the removal of adhesives needs to be done and the filling of holes where needed. Sometimes even after using great care, the panel will need to be refinished to blend the area where light has not faded the panel. Here is the refinished panel, sign removed, adhesive removed, holes filled, expertly color matched to blend to the surrounding panels. 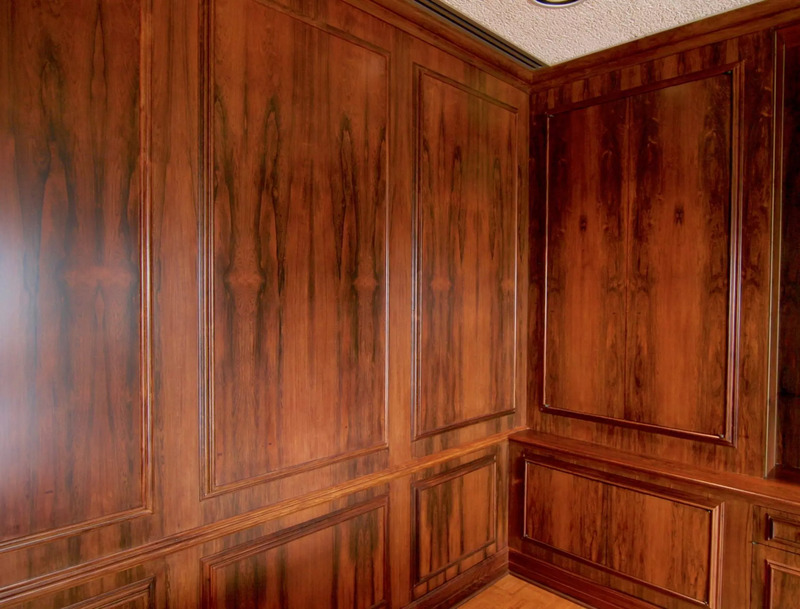 All of this work was done in one evening by our expert wood finisher and touch-up artist Rick Bean. 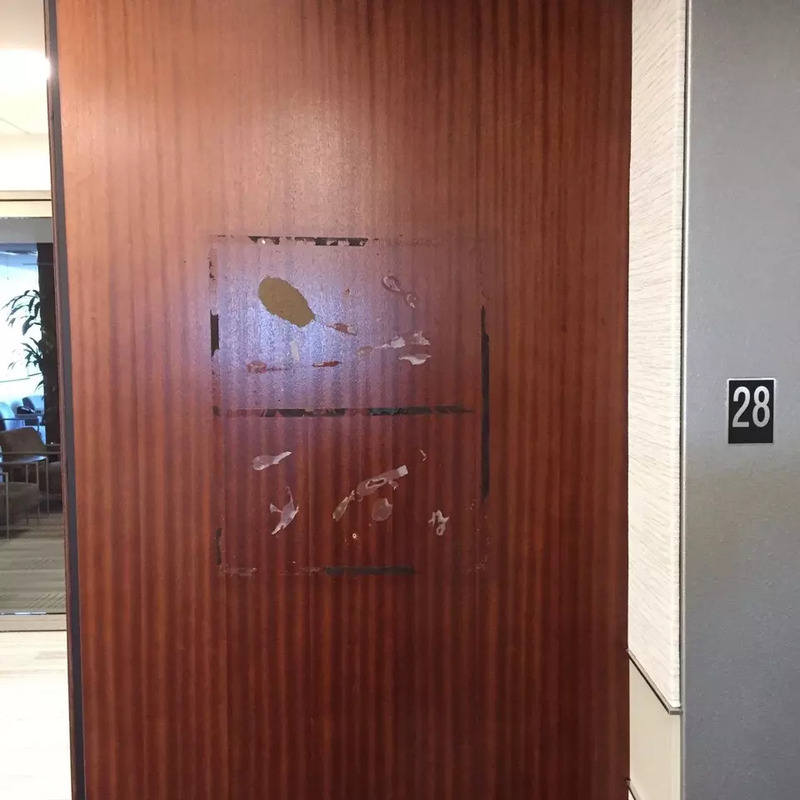 An electrical outlet was removed from the middle of a beautiful wall panel. 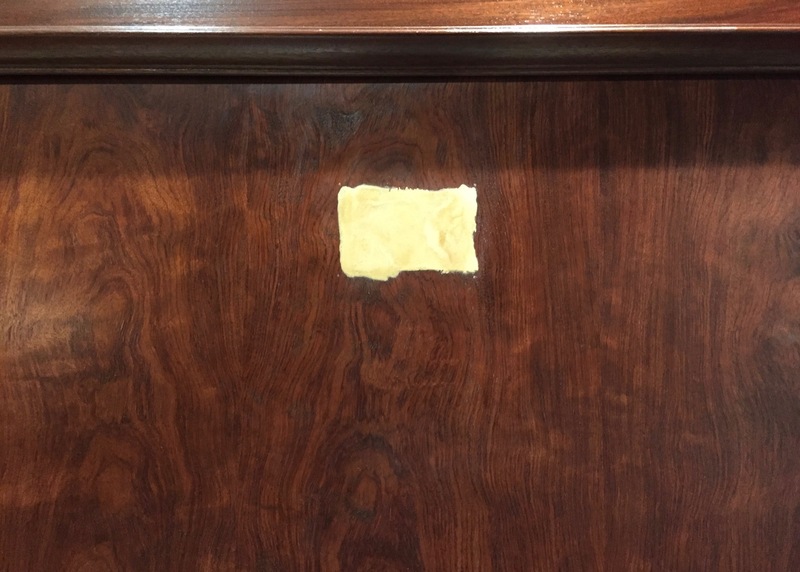 Our touch-up artist and estimator Rick was able to fill the hole in the wall and faux grain the area to blend seamlessly. 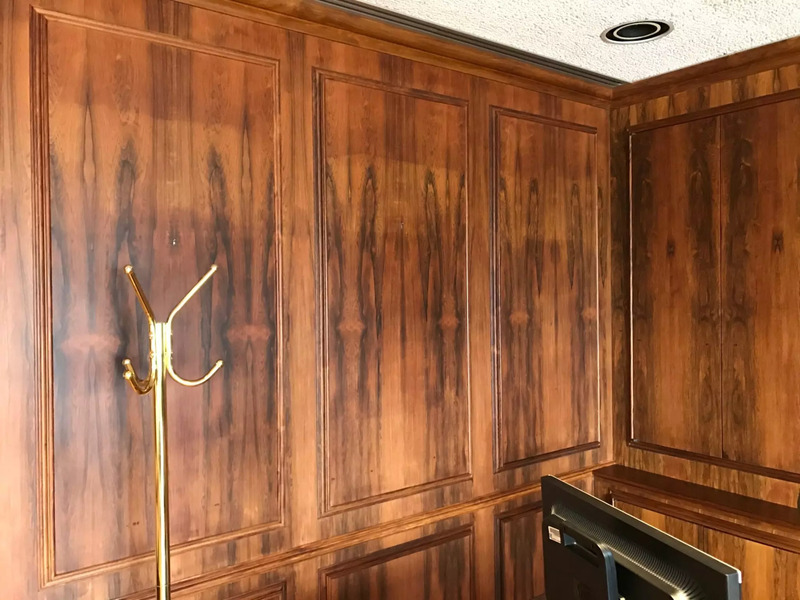 The Brazilian Rosewood panels in this executive office were faded from years of UV exposure. Pictures hung on the wall at various times protected the wood in some places from fading, but left a very uneven appearance. 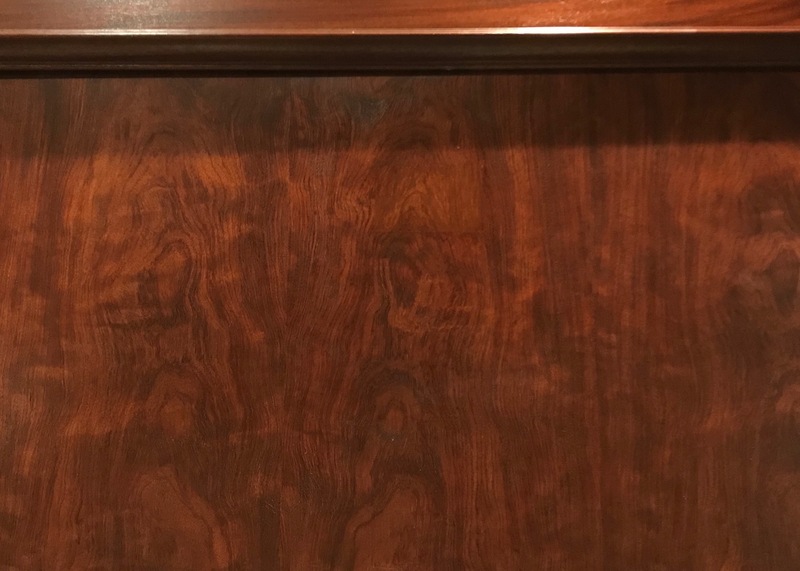 Our expert wood finishing staff was able to blend the color with a custom matched colored finish, which we call a toner. The results are stunning in this beautiful Minneapolis office. 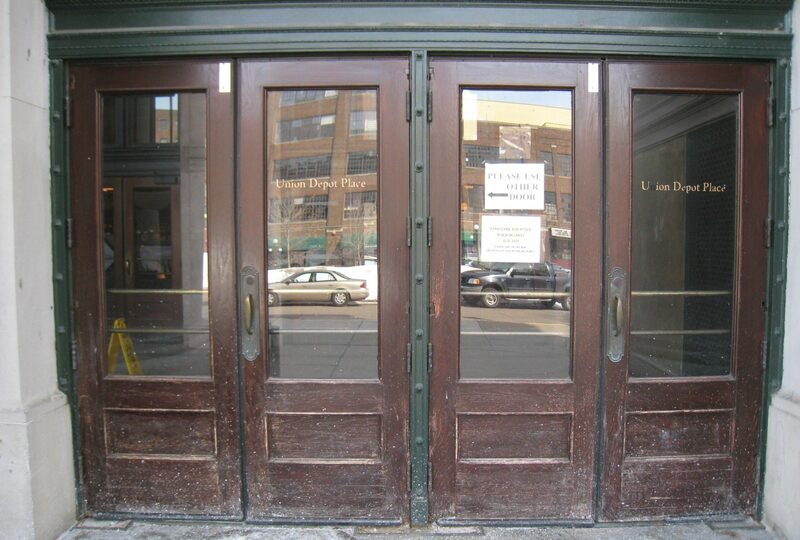 The finish on the doors at the Union Depot in St. Paul were in very rough condition from years of neglect and poor maintenance. 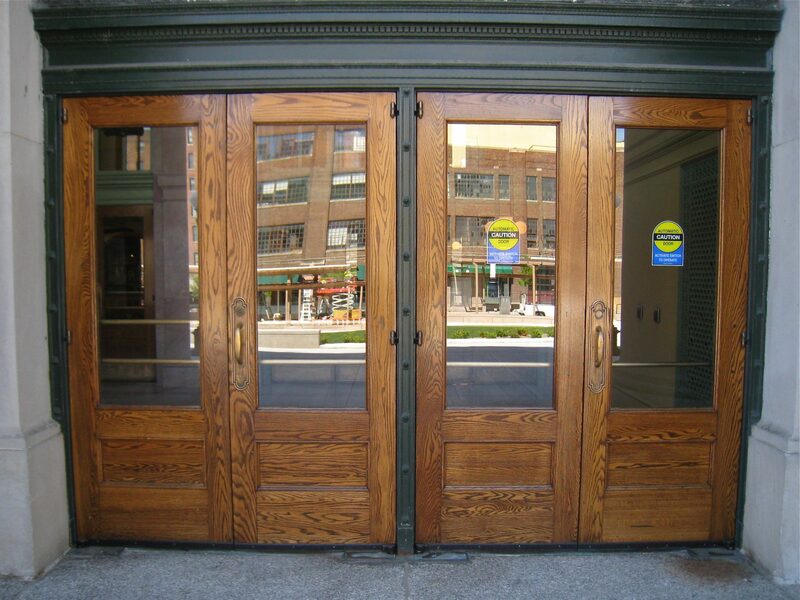 When the Union Depot underwent complete restoration our experienced wood finishers were able to completely remove the old failing finish, custom match to a provided sample, and apply a high quality exterior grade varnish. 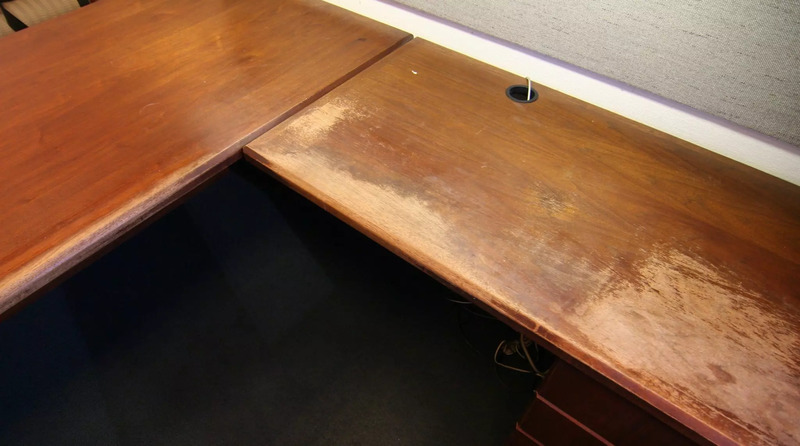 Is the wood finish on the desks in your offices worn out like this one? The wood finishers at Fresh Air Finishers can remove the old finish, custom match the stain, and apply a beautiful high quality finish with three unique features!! This can all be done on-location in your office with no strong residual odors, no dust, and very minimal down time!! 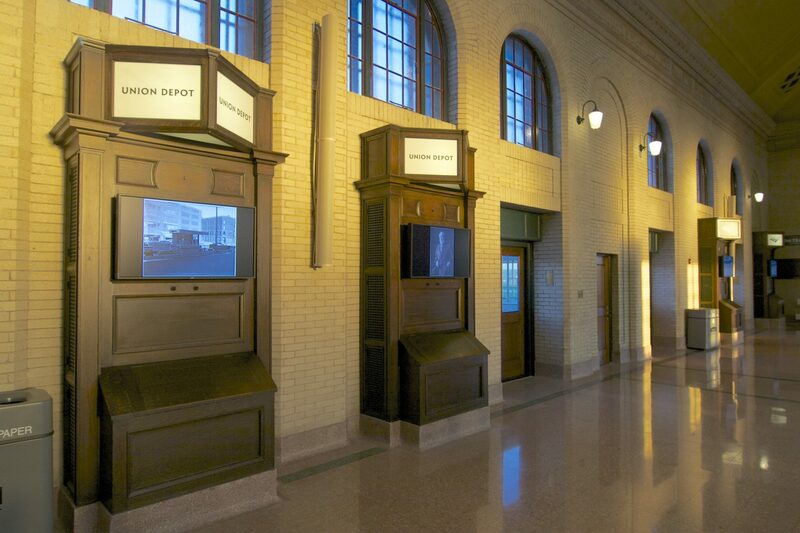 In 2012 the Union Depot in St. Paul underwent a complete restoration project. Inside the Depot stand these very unique Track Cabinets. Their purpose was four-fold. Tell the arrival and departure times of the trains (clock face has been removed from center upper face). 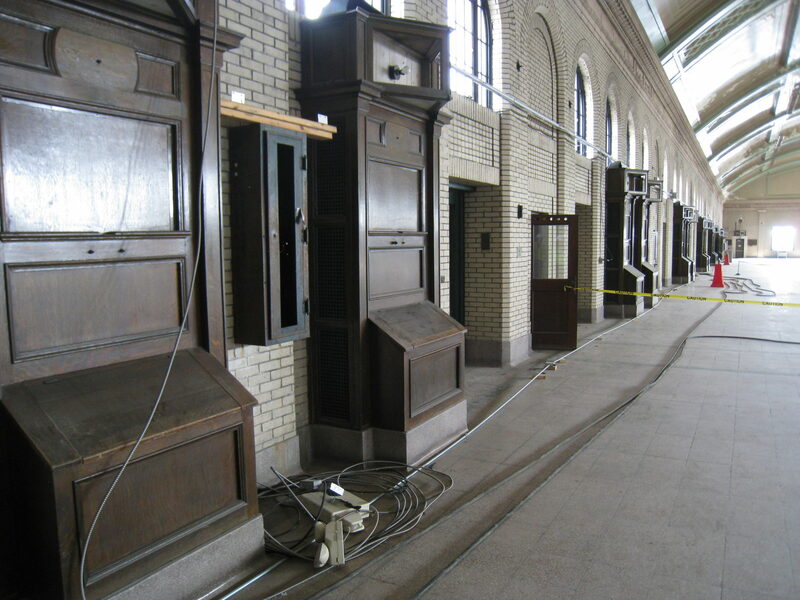 A light would go on indicating the arrival of a train (top of cabinet). Placards describing where the train was going and coming from stored in the lower section of the cabinet. Finally the entire cabinet was insulated with galvanized steel and seaweed, as it functioned as a radiator cabinet. Ductwork was originally attached to the top of the cabinet. The original finish was intact yet in tough shape. The wood finishers and touch-up artists at Fresh Air Finishers were able to restore the original finish on the cabinets. Repairing and replacing broken pieces, custom mixing and replacing color where needed, cleaning, and applying a protective finish. 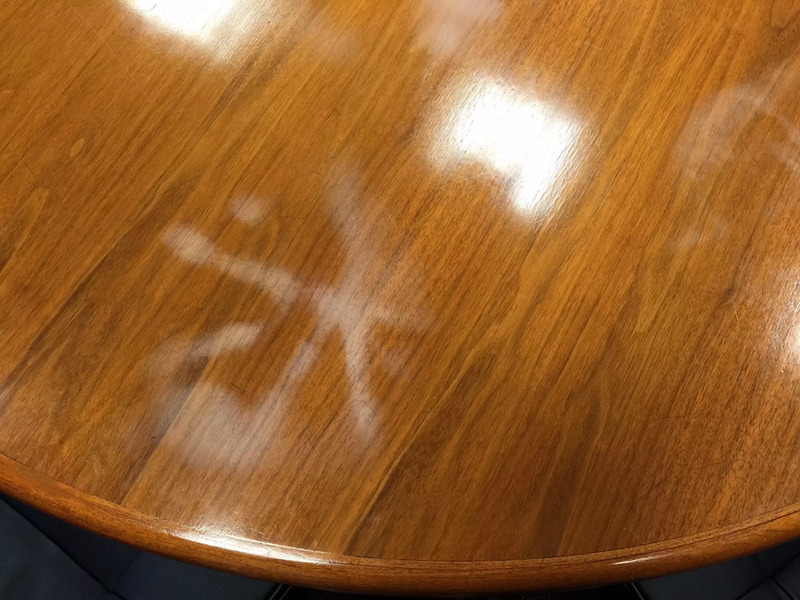 Fresh Air Finishers has refinished many conference room tables. 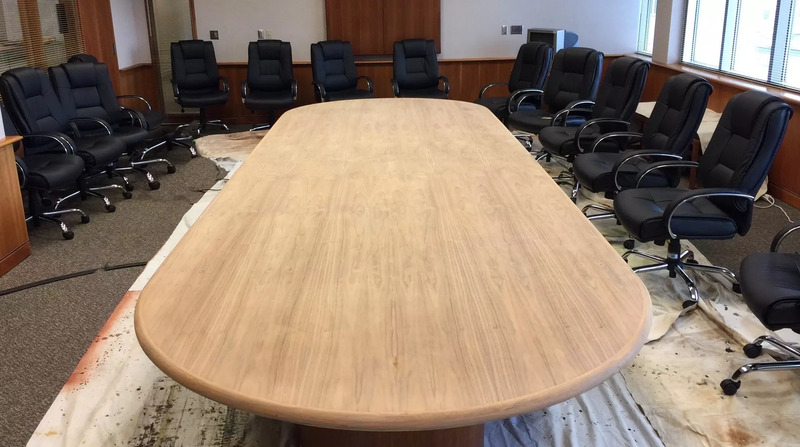 Conference room tables can be very challenging to move, especially if they have been fitted with electronics. USB ports, microphones, etc. 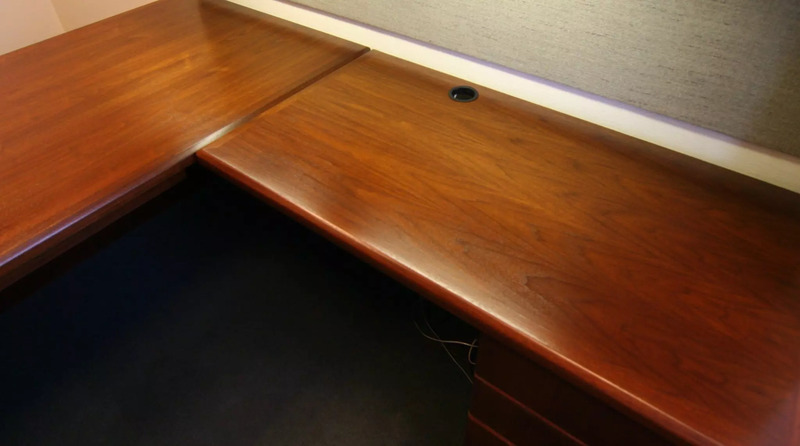 Our wood finishing professionals can come to your location and refinish the table onsite. Here is a picture of the finished table ready for use. No dust. No residual odors. 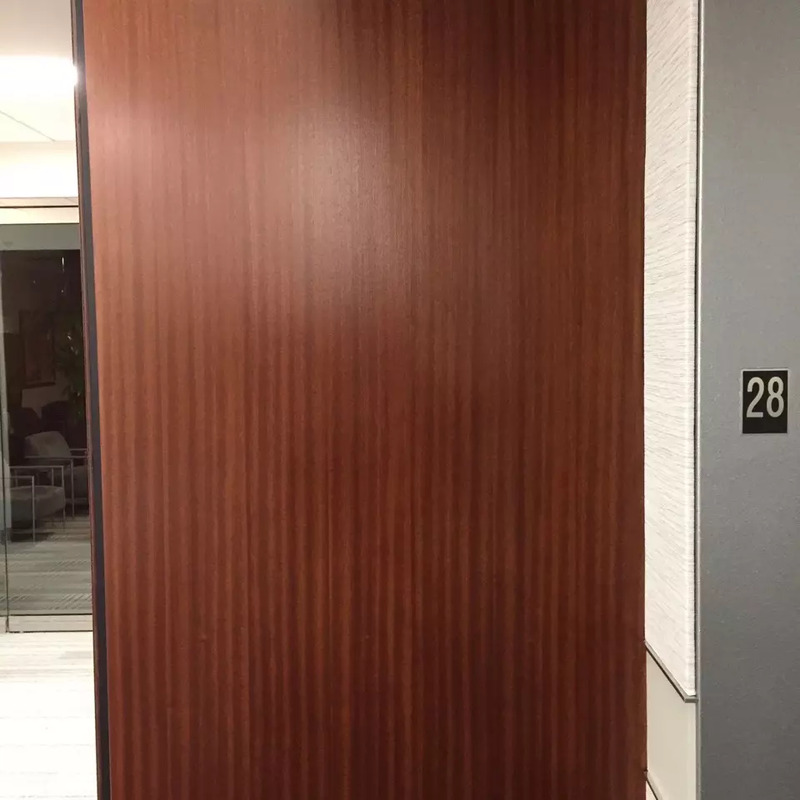 Custom color matched onsite to blend with the clients woodwork. 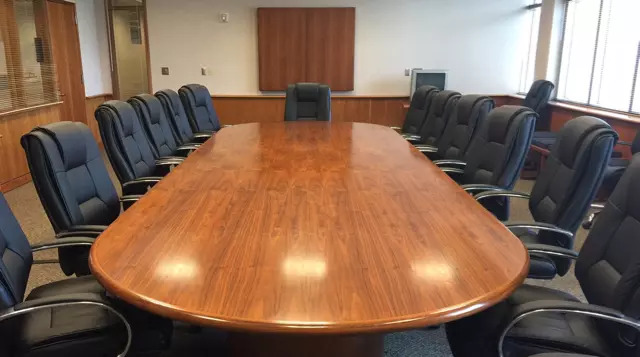 Give us a call to schedule a visit for us to evaluate your conference table. Water marks under the finish from hot pizza boxes, or coffee, etc. can many times be removed from conference tables desks or other table tops. 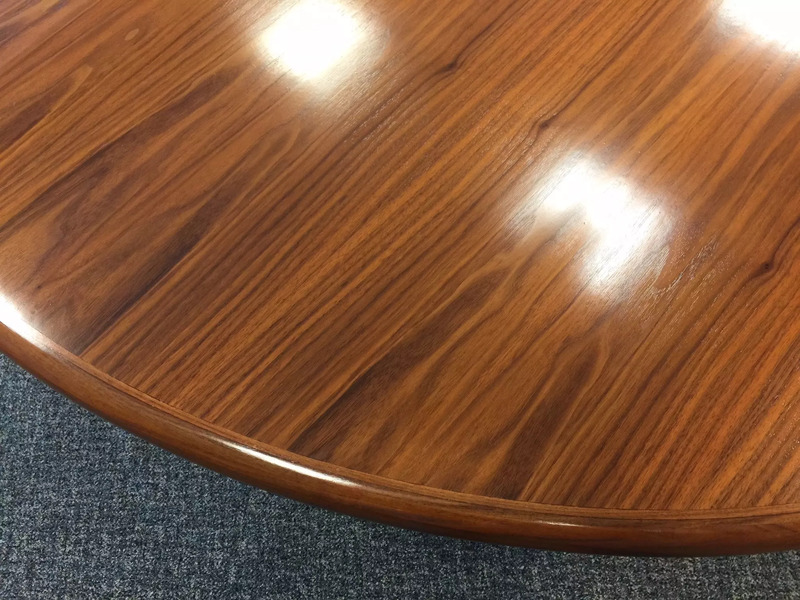 Sometimes the finish is old and worn out and needs to be refinished like this table, and we can do that as well. Give us a call and we’ll be happy to come out and assess the damage.